Measure 1½” to 2” (3-5 cm) up from the corner of the horse’s mouth. From that point, measure the circumference of the horse’s nose (noseband measurement). From that same point (1½” to 2” / 3-5 cm up from the corner of the horse’s mouth), run your tape measure up the side of the face, around the poll (behind the ears) to the same point on the other side of the face (headstall measurement). * Another way of getting the headstall measurement is to measure (from 1½” – 2” / 3-5 cm up from the corner of the horse’s mouth) to the very top of the poll (to the point right between the ears) and double that measurement. Please also see the diagram and further fitting information before measuring. Use these two measurements to select the correct headstall & noseband size of your chosen bridle. Please note that the sizing varies according to the material (ie pony, cob etc only refer to leather bridles; synthetic bridles are sized in small, medium, large etc). The bridles are all adjustable and correct fitting is rarely a problem. **We can 'mix & match' (for example, full size headstall with cob noseband) at no extra charge, to ensure the correct fit for your horse. These options are catered for when ordering from our Safebuy Assured shop. Simply choose headstall size, then select noseband size from the dropdown boxes provided. We have 'special sizes' (eg extra small noseband, extra large browband) in stock in black and brown beta; special sizes can be made for you in other materials but these may take a few weeks to arrive. Mix & match any noseband / headstall combination! A driving version of the Bitless Bridle™ is available in Beta only and differs from the riding version only by the addition of blinkers and a throat latch; matching driving reins are also available. These bridles are made of English Bridle Leather and are available in Havana brown, Newmarket (light tan with black edge) or black. The components of bridles are not stitched together (from October 2005 the noseband and cheekpieces on leather bridles have been incorporated, as they are on the beta and webbing versions). This allows for more adjustment and therefore better fitting especially for wide-jawed horses and allows for the crossover straps (which cross under the jaw) to be replaced when showing signs of wear. Inevitably, there is considerable friction where these straps run through the 'O' rings on the noseband. If they were not detachable, the whole bridle would have to be replaced when wear occurred. Buy a leather Bitless Bridle in our Safebuy Assured online shop. A webbing material, easily cleaned (machine washable), extremely durable and virtually unbreakable. This latter quality is actually a potential disadvantage if a horse gets loose and you are using webbing reins. A horse that puts its foot through a nylon rein loop may fall and/or seriously damage its leg before being released. This risk has been eliminated in the reins of the synthetic Bitless Bridle by introducing a leather thong, rather than a buckle, on the reins at the level of the rider's hands. In the event of an accident, the reins will break at this weak link. As the pressure from the bridle is distributed over the whole of the head, the nylon webbing is still perfectly alright for a thin-skinned horse, as long as the fit is correct and the bridle is reasonably clean. Remember that accumulations of dirt are responsible for the nylon becoming unacceptably stiff, so regular washing is necessary. All parts can be purchased separately (note the noseband & cheekpieces are incorporated) in case of damage or wear. Black and brown are the standard colors. Buy a webbing Bitless Bridle in our online shop. This is a flexible form of vinyl covering over a nylon foundation with the feel and softness of a synthetic rubber. It has a slightly grainy surface and low-sheen surface, which gives it a leather-look appearance. Beta is a little heavier than the other synthetic bridles. Some people like the extra weight in the reins, as it provides a constant but slight contact with the head. The Beta material is very easy to maintain and can be kept clean easily by dunking in a bucket of water or by machine-washing (cool cycle). Beta bridles are available in black, dark brown or chestnut brown. Buy a beta Bitless Bridle in our online shop. See Gallery for photos of all Dr Cook crossover Bitless Bridles (English leather, Beta synthetic, nylon webbing, Western leather, driving). The reins are of a standard design so you have the option of using your own reins. The headstall has two long-tailed crossover straps (that cross under the jaw) which carry 'O' rings for reins to be attached with the standard loop-and-buckle or stud fitting. This recent modification of the original design means that you can just order the headstall if you wish to use your existing reins. The 'O' ring attachments also have the advantage that the same headstall can now be fitted with either a 5/8" rein or a 1" rein. This enables one headstall to serve two purposes, if required, ie, for English or Western riding with a 5/8" rein, or for racing with a 1" rein (or for providing additional control for any particularly aggressive non-racehorses). It also enables the headstall to be instantly converted into either a halter for leading (similar to a 'Be-Nice' halter) or a headcollar for tying up your horse (for the details on how this is done, see below). Trail riders, in particular, find this versatility of The Bitless Bridle™ to be invaluable. The Bitless Bridle™ design also allows a horse to graze and drink without needing to have its bridle removed. All materials except nylon webbing are supplied either as plain reins, or optionally with rubber grips. Webbing reins come only with rubber grips. In addition, 1" webbing reins are rubber-gripped for racing only, so if you want non-racing webbing reins, be sure to order only the 5/8" size. Laced reins are available in leather only. Buy reins in our online shop. For harness racing and for general carriage driving work, the recently modified headstall allows trainers and owners to use their own reins. 5/8" reins are recommended for English and Western riding, though apart from the constraints of tradition there is no reason why 1" reins should not be used if preferred. The wider reins provide a better hold and are preferred by some cross-country riders. With rubber grips added, a 5/8" rein becomes, in effect, 1" wide. Nevertheless, it should still be ordered as a 5/8" rein. Similarly, a 1" rein with rubber grips becomes a fraction wider than 1". On the regular reins, the rubber grips are 36" long. Leather reins can be ordered in 1" widths if preferred but 5/8" is the standard width. Sadly we are no longer able to supply the quality of rope reins that were specially made for us; we have so far been unable to source anything that comes near the quality of them but will keep looking. By using scissor snaps your Bitless Bridle™ is three items of tack in one (bridle, headcollar for tying and halter for leading [similar to the Be-Nice halter]) with the added advantage of being able to detach and re-attach reins quickly and easily! These adaptations are of particular use to trail-riders. Note: The Be-Nice Halter is currently retailing at around £30 in the UK. You will need 2 pairs of scissor snaps (one pair is left on the reins, the 2nd pair is used to convert into a headcollar). For quick and easy manipulation of the reins, use a pair of scissor-snaps to attach the reins to the 'O' rings on the crossover straps of the headstall. The loop of the reins is threaded through the base of each snap (see picture). This allows the reins to be detached and re-attached quickly and easily during rest periods; when washing or cleaning the bridle or when removing the reins to use the Bitless Bridle as a headcollar or for lunging. Assuming the reins are already attached to the headstall with scissor snaps, simply use one of the existing snaps to link both reins at the point where they attach to the crossover straps of the headstall. You now have a facsimile of the Be-Nice halter, also called a 'come-along'; use the reins to lead your horse. With reins detached, you can also use the Bitless Bridle™ for loading, leading, training or lungeing by simply attaching a training rope or lunge line to the two 'O' rings of the headstall. Take a scissor snap and link the 'O' ring attachment on the crossover strap for the left rein to the 'O' ring on the right side of the noseband. Using a second scissor snap, do the same for the other side. You now have a serviceable headcollar. 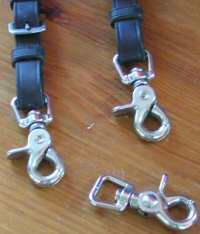 (The length of the crossover straps can be adjusted to obtain the ideal fit of the head collar). Remember that if you are using one of the synthetic bridles (nylon or Beta) you also have a virtually unbreakable head collar. Detach the reins and tie your horse up in the normal way, using perhaps a standard lead rope attached to the 'O' ring on the right or left side of the noseband and a quick-release knot at the point of fixation. Quick Release: For your horse's better safety and also to prevent your head collar being broken, an additional precaution is to use a quick-release device and with your lead rope. To save such an accident from happening out on a hack, trail ride or elsewhere, it makes sense to use a quick release device in combination with The Bitless Bridle™. Various Quick-Release Accessories are available in our online shop. You can buy The Bitless Bridle online in our secure online Shop.